Click on each service listed below to learn more about available relay services for people who have a speech disability. A brown-skinned young man wearing a maroon button-down shirt. 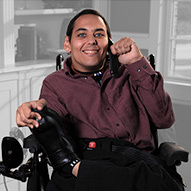 He is in a wheelchair, and is smiling as he holds a telephone receiver to his left ear. A light-skinned woman wearing a red short-sleeved shirt. 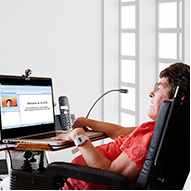 She is seated in a wheelchair, looking at her laptop with a microphone near her face. A light-skinned man with white hair and glasses, wearing a plaid shirt and a wristwatch. 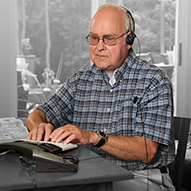 He is seated at a table, typing on a device and wearing a headset. A brown-skinned woman who has short hair and is wearing a light blue blouse. 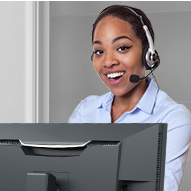 Wearing a headset, she is smiling into the camera. In front of her is a computer monitor.